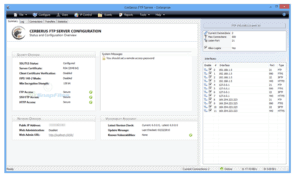 Cerberus FTP Server 10 is designed with the network administrative professional in mind. It is a feature packed solution with support for SFTP file transfers, along with other protocols such as FTPS. 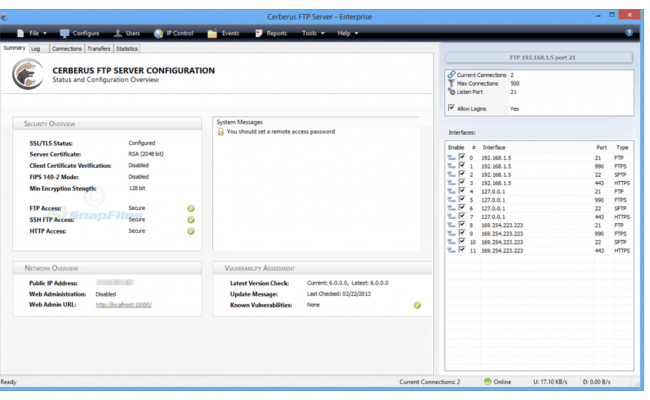 Cerberus FTP Server 10 is trusted by companies like Boeing, NASA, Microsoft, Intel, HP and more! Supports secure SSLv3/TLSv1 encryption, IP security and offers statistics on connections as well as logging capabilities. Certified for Use in regulated Industries such as financial and health-care institutions where sensitive information is being used. Trusted by Companies like Boeing, NASA, Microsoft, Intel, HP, and more!